ScaleUp Club is changing up a gear – you might even say it is ‘scaling up’! 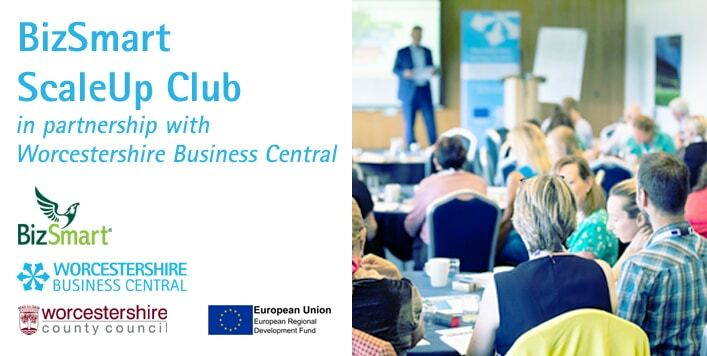 It is now running in partnership with Worcestershire Business Central (WBC) – and it’s going to be moving around the region – making it easier for business owners in different parts of Worcestershire to attend – and it will be free! ScaleUp will run alongside ‘Inspiring Growth’ – a parallel stream of events run by WBC – all under the scaling up ‘pillars’ of Strategy, People, Execution and Cash. ScaleUp sessions explore the themes from within the pillars and are aimed at gaining freedom and control – escaping the owner’s trap – and providing the tools to scale up successfully and to navigate the ‘Valleys of Death’ along the way. The focus is on collaborative working with peers, addressing issues and opportunities and coming away with key take-aways/ actions that can be implemented. The Inspiring Growth roundtable events will explore the broader aspects of the core pillars using subject specialists and roundtable discussion – dovetailing neatly with the ScaleUp events. What do previous attendees say about ScaleUp Club? “The BizSmart ScaleUp Club is a useful place to get an alternative view on a business topic. People from other market areas often have slightly different ideas which can make you think ‘outside the box’.